1- How powerful is my Cook Expert? 2- What are the Cook Expert’s minimum and maximum speeds? The minimum speed is 250 rpm and the maximum speed is 6,000 rpm. 3- What are the Cook Expert’s minimum and maximum temperatures? The minimum temperature is 30 °C and the maximum temperature is 140 °C. 4- What are the Cook Expert’s maximum processing capacities? Metal bowl: 2.5 litres soup or stew, 1 kg mashed potato, 0.6 kg steamed vegetables, 6 beaten egg whites, 0.8 kg bread dough, 1.2 kg cake mix, 400 g frozen fruit for sorbets. Clear bowl: 1.4 kg grated/sliced vegetables, 1.4 kg meat. 5- Are my Magimix food processor attachments compatible with the Cook Expert? If you have a 5200XL all accessories are compatible with the Cook Expert. If you have a 4200XL the following accessories are compatible; discs, citrus press, centrifugal juicer, dicing kit and mini bowl. If you have a 3200XL the discs, dicing kit and mini bowl are compatible. 6- How do I release the bowl? Once the blades have stopped turning, unlock the lid, then you can remove the bowl. 7- How do I switch my Cook Expert on? Check that it is connected to your mains supply. Flip the switch located on the back of your Cook Expert to 1, the screen should now light up. 8- How do I quit the Demonstration mode? Your appliance has a no-heat Demonstration mode for use in store. To return to the classic mode, go into the SETTINGS menu and select “Demonstration”, then “OFF”, and click on “OK”. Next, go back into the SETTINGS menu, select ‘Standby’ then set the time before your Cook Expert goes into standby mode. - To preserve qualities of this glass, do not use abrasive products or sponges. If necessary, soak the lid in soapy hot water. - Do not use a cracked, chipped or scratched lid or one that has suffered extreme shock. Should this be the case, contact our Consumer Service. Check that the seal is properly slotted in the rim. Check that the seal is not damaged. If you are heating milk, reduce the amount (milk can easily boil over, just as it does in a saucepan). Check that the blade seal is in place. Check that the blade is securely fitted. After washing the bowl in the dishwasher, leave it to drain on your draining board before putting it back on its base: water may sometimes find its way between the two walls of the bowl and will run out through the hole beneath the handle. When you use your appliance for the first time, or if it overheats, it may smell slightly. This is nothing to be alarmed about, and will disappear after you have used your appliance a few times. Allow the motor to cool down for 30 minutes before switching it back on. Either the bowl or the lid has not been correctly secured. Replace the metal bowl with the clear one, or vice versa. Your appliance is fitted with a thermal device that protects the motor from overheating. Reduce the amount of ingredients and/or reduce the size of some of the pieces. Allow the motor to cool down for 30 minutes before you switch it back on. Switch your appliance off then on again. 19- Why does food sometimes stick to the bottom? Just like in a saucepan, some preparations, especially ones containing milk or cream, can stick to the bottom. Try to use ingredients that are at room temperature, make sure you keep to the temperatures indicated in the recipes, and for recipes where you have encountered this problem in the past, try reducing the temperature and increasing the speed and cooking time. A sudden change in temperature causes milk to burn more easily, keep the temperature below 100°C, and try using smaller amounts. 20- How can I remove food stuck to the bottom of the metal bowl? If food is badly stuck onto the bottom of the bowl, remove it with white vinegar, possibly leaving it to soak before washing it off. You can safely use a scraper or a Spontex steel spiral scourer. 21- I’ve noticed sparks or “flashes” at the back of my food processor. In a dimly lit room, you may well glimpse sparks through the ventilation grids at the back of your Cook Expert. These are a characteristic of the sturdy (30-year warranty) commercial-grade motor we have chosen to withstand the wide variations in speed. They are entirely normal and nothing to worry about, and certainly do not affect the operation, efficiency or durability of your Cook Expert. However, if you are concerned please call our customer care team. 22- When I fit the clear bowl, I find it impossible to switch to the FOOD PROCESSOR programme. Position the clear bowl adapter, then install the clear bowl itself. Close the lid, then add the large pusher. If the FOOD PROCESSOR programme still does not appear on the screen, press the back arrow to return to the main menu and select the FOOD PROCESSOR from the main menu. Ensure you have fitted the black bowl adaptor to the bottom of the food processor bowl. 23- My glass lid is quite stiff to open and close. The lid may initially be a little stiff to open and close, but this will soon loosen once you have used your appliance a few times. You can also rub the seal with a little food-grade oil if you wish. 24- The motor does not start when I select one of the SOUP programmes. This is entirely normal, as the Cook Expert only starts blending the ingredients about a minute before the end of the SOUP programmes. 25- Simmer - Can I use my Cook Expert to simmer stews and cook with delicate ingredients? The Cook Expert is perfectly suited for stews or delicate dishes thanks to its 2 intermittent speeds 1A, 2A and the position 0 that permits to cook without mixing. But the result can vary, depending on the ingredients used, particularly meat. Carrot: a spring carrot will cook quicker than a winter carrot but will also be more fragile. Slow cooked dishes: The speed 1A is recommended (it replaces the spoon stirring the casserole). For classic stews as Beef bourguignon, Veal blanquette… (Meat cooked in a large quantity of liquid that needs a long cook): midway through cooking, you can select the speed 0 to preserve your meats particularly delicate cuts. For stews of vegetables, tagines, stir-fries… (Shorter duration of cooking and low quantity of liquid): it is recommended to add some liquid if you want to use the speed 0, monitor the cooking to avoid sticking. Risotto, stir-fries rice…: dishes with little liquid, it is necessary to regularly stir to prevent sticking (as in a casserole). In that case, the speed 2A is ideal. Monitor the cooking and adjust the time if necessary (e.g. some rice cooks quicker so cooking has to be stopped before the indicated time to avoid having over-cooked rice). Depending on rice, it can be sometimes necessary to add some liquid. Always add the fragile ingredients at the end. Prawn curry, Basque-style chicken…: liquid preparations with delicate ingredients. Firstly, prepare your base (cooking stock, stew vegetables…) at speed 2A or 3 then, put the speed 0 when you add the fragile ingredients. For meats with bone, fry them in a pan before adding it to your preparation. If you add some cream or milk (cow, coconut…), do it at the last moment to prevent sticking. With the FROZEN DESSERT programme, you can make almost instant ice creams and sorbets. The end result is softer, however, than a factory-made ice cream. It is important to chill your bowl beforehand, either by leaving it in the freezer for 30 minutes or by blitzing a handful of ice cubes in it using the CRUSHED ICE programme. 27- How do I beat egg whites? The bowl and whisk must be perfectly clean and dry, with no traces of oil or fat. Place the whisk in the bowl with your egg whites, remove the cap from the lid, then start the EGG WHITES programme. It is vital that you remove the cap, otherwise your egg whites will not be light and airy. For fluffier egg whites, make sure your eggs are at room temperature and add a pinch of salt. With the EGG WHITES programme, the whites will be extremely fluffy, so for a stiffer finish (e.g. for meringues), increase the speed to 7. 28- How do I whip cream? Make sure you use full-fat (at least 30% fat content) not low-fat whipping cream. 1) Chill the bowl beforehand, either by placing it in the freezer for 30 minutes, along with the egg whisk and cream, or by blitzing a handful of ice cubes in it using the CRUSHED ICE programme (dry the bowl thoroughly before pouring the cream in). 2) Pour the full-fat cream into the bowl fitted with the whisk. 3) Remove the cap first, run the EXPERT 2 programme for 2½ minutes at Speed 7 (no heat). Depending on the type and temperature of the cream you use, you may need to continue running the programme for a few more minutes, but keep a close eye on the cream to make sure it does not turn to butter. The cream is fully whipped when the whisk leaves a trail in it. 29- Do I have to fit the midi bowl inside the main bowl in order to use the mini bowl? No, you can leave the midi bowl out. 30- Can I make the recipes with smaller amounts? Yes, but you will probably have to adjust the cooking times. 31- Can I adapt my own personal recipes? You can, of course, adapt all your favourite recipes, using the EXPERT mode, which allows you to select the time, speed and temperature you need to make them. Just ensure you never exceed the maximum amounts. 33- Is there an easy way of measuring out the ingredients in ml? Use the graded pusher from the XL feed tube (multifunction clear bowl). 1- How do I clean the bowls? Metal bowl: to make it easier to clean, run the RINSE programme straight after use. If you made a recipe requiring the egg whisk, make sure you remove it before starting the RINSE programme. Next, remove the blade assembly and carry out a thorough clean. If necessary, you can use a brush or a steel spiral scourer. Transparent bowls: clean the bowls and attachments with a nonabrasive sponge dampened with water and washing up liquid. 3- How do I clean the rim of the lid? We recommend you wash it in the dishwasher to avoid odours. Allow to dry naturally or wipe with a soft cloth. To make cleaning easier, run the Rinsing programme immediately after use. If you have just followed a recipe requiring the use of the egg whisk, make sure you remove this attachment before starting the Rinse programme. Pour in 0.5 litre water add a few drops of washing-up liquid. Close the lid and replace cap. Start the Rinsing programme. Rinse with tap water. Clean thoroughly. Always unplug your appliance first and wait for it to cool down if necessary. 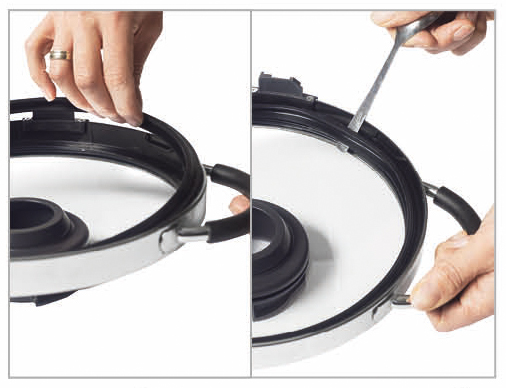 Remove the seal from the rim of the lid. If necessary, use a spoon handle to help you. Unscrew the blade assembly (see question 8) and remove the seal. Use a brush to clean under the blades properly. 5- Are bowls and parts dishwasher safe ? All the parts (except for the motor base) are dishwasher safe and can also be washed by hand. The bowl should be placed completely upside down in the dishwasher, then allowed to drain the right way up on your draining board before being put back on its base. That way, any water that has found its way inside the double wall will run out through the hole beneath the handle intended for that purpose. Check that the underside of the bowl is dry before putting it back on its base. 6- What should I use to clean the screen? You can clean the screen with a cloth dampened with soapy water or a little window-cleaning fluid. 7- How can I get rid of strong smells (e.g. onion)? To get rid of lingering smells, wash the lid seal in the dishwasher. You can also use white vinegar to combat any odours. Make sure you always remove the cap when the machine is not in use, to avoid trapping odours. You can also run the STEAM programme with 0.5 l water and half a lemon to reduce strong smells. 8- Must I clean the blades each time I use them? The RINSE programme makes cleaning far easier, although it is best to remove the blade assembly afterwards for a more thorough clean. 9- How to remove (and attach) the blade assembly ? Ensure you place a soft protection on your worktop as once the blade is loose it will fall out of the bowl. Turn the bowl upside down and use the cap as indicated in image above. Turn the cap in a clockwise direction to release the blade. Holding the universal blade assembly by the top, remove the seal for cleaning. Put the seal back on the blade. The seal has two straight sides to help you position it correctly. Slot the base of the blade assembly into the hole at the bottom of the bowl. Turn the bowl upside down, ensuring you are securely and safely hold the blade in place. Position the screw on the underside of the bowl and tighten with the cap by turning in an anti-clockwise direction. 10- How do I clean the blade assembly? Refer to question 8. Once it is removed simply wash using hot soapy water. Remember to replace the deal before re-assembling your Cook Expert. 11- After washing my Cook Expert bowl lots of water drains out of the handle. In order to retain the heat, the metal bowl is double walled. When washing up the bowl, water can become trapped between the two walls. We recommend draining your bowl with the handle at the lowest point, which will allow the water to drain away slowly. 12- Some recipes have a small icon in the top right corner. What does this mean? These icons refer to specially chosen recipes by Magimix to help you get started. Please see below for an explanation as to what each of the icon’s means. 1- What precautions should I take when using this appliance? - This appliance is designed for use in the domestic home, therefore do not use your appliance outside. - Never unlock the lid without pressing the STOP button first. Your appliance is fitted with a thermal failsafe that automatically switches the motor off if it is overloaded or has been running for too long. If it is activated, press the STOP button and wait until the machine has cooled down completely before switching it on again. - Please be aware that the blades and discs are extremely sharp, therefore care should be taken at all times when handling the blades and discs for yours and others safety. ​- The metal blade is extremely sharp. Always hold it by the central hub. When emptying the bowl, either remove the metal blade first or hold it in place by placing a finger on the central hub. - Never exceed the recommended quantities. • Always handle the discs and blades with caution, as they are extremely sharp. • Never push ingredients through the feedtube with your hands, particularly when using one of the discs. Always use the pusher provided. • Never insert your hands or a kitchen utensil in the feedtube or any other lid opening while the appliance is running, to prevent serious injury and avoid damaging the machine. • You can use a spatula, but only when the machine is no longer running. • Always check that the lid is properly locked into place before switching your appliance on. • Never attempt to override the lid-locking mechanism. • Always remove the blade or disc before removing food items using your hands. When the machine is in use, some parts can become extremely hot (e.g. outer steel sides of the metal bowl, lid, cap, metal parts under the bowl, basket) and inflict burns. Make sure you only handle the cold plastic parts (e.g. handles) whilst the machine is in use and immediately after use. Accessible surfaces may become extremely hot when the machine is in use. Your appliance releases steam that can cause burns. • Always hold the cap by its central plastic part and the lid by its handles. • Never run your appliance if the lid, the lid seal and the blade assembly seal have not been correctly fitted. • Only use your appliance if the cap is in place, unless stipulated otherwise in the recipe. • Never fill above the 2.5-litre mark. • The functioning of this appliance conforms to current electromagnetic interference standards and thus is in total compliance with legal requirements. • To ensure that there is no interference between your appliance and a pacemaker, the latter must have been designed and programmed in compliance with the regulations that apply to it. As such, we can only guarantee the compliance of our own product with current standards. With regard to the compliance of the pacemaker or any potential incompatibility, you should obtain information from the manufacturer or your attending physician. • Your appliance should always be connected to an earthed socket. • Always check that the voltage shown on the identification plate of your appliance corresponds to the voltage of your mains supply. • Never allow the power cord to dangle over the edge of your worktop or counter, and make sure that it does not come into contact with hot surfaces. • Always turn your appliance off with the switch at the back, once you have finished using your appliance, if you are going to leave it unattended, clean it, or remove or add accessories. • If the power cord has been damaged or if your appliance no longer works properly, it must be replaced or repaired by the manufacturer, a Magimix-approved service agent or a similarly qualified person, in order to avoid all risks. • The use of parts that are not sold or recommended by Magimix may cause a fire, electric shocks or injury. How do I format my USB drive to FAT 32? Make sure you haven’t downloaded them twice. Your computer will automatically rename the files (e.g. flash(1).bin). The files have to have their original names to work with the Cook Expert. If necessary, rename the files. What type of USB drive should I choose? Choose a standard USB drive which can be inserted easily into the USB port. We do not recommend using drives that have special shapes. Also, it is better to use small capacity drives (between 2 and 10 GB). Why do I need to format my USB drive? So that the Cook Expert can easily recognise the activation files for the new functionality. How do I know if my USB drive is the right format? 2. Go to General > File System If you can see FAT 32, the formatting is correct. Click Cancel. I was interrupted or there was a power cut during the update. What should I do? No need to worry. Turn off the Cook Expert. Insert the USB drive again and start the activation process for the new functionality again. The language has switched to French. 1. The program didn’t have enough time to be completely install. Start the process again and make sure you don’t turn off the Cook Expert before the Cooking mode appears. Ditto for the USB drive which must not be removed during installation. Wait for at least 40 seconds. 2. Check that your USB drive only contains the two .bin files and nothing else. Make sure the drive is blank before downloading the files. Make sure you haven’t copied and pasted twice. After launching the program, it starts but the Cook Expert does not heat up nor does it mix. Go to Settings and turn off Demonstration mode. What is the HOT MIX mode? The HOT MIX mode was added to meet the demand of certain countries. If the HOT MIX mode is activated, the Cook Expert will be locked as soon as the temperature goes above 60°C AND the speed is more than 12. It has to be unlocked (press the button next to the padlock for 3 secs) before your hot preparations can be mixed. How do I deactivate the child safety feature? Press the black button next to the padlock for a few seconds. How can I access the new attachment programs? The thermometer turns red when I am using the Cook Expert. A pilot light has been added by the update; it turns red as soon as the temperature reaches 60°C. I followed the entire process but nothing happened. Perhaps you didn’t press the right buttons. Press the two black end buttons under the STOP button. At the same time, turn the base on and wait for 10 seconds while holding the buttons down. You can release them when a white flash or writing appears. I pressed the right buttons but nothing happened. You didn’t press the buttons hard enough and/or for long enough. Wait for at least 10 seconds before releasing the buttons. I carried out the process correctly and waited for a sufficiently long time but nothing happened. Check that you didn’t accidentally erase the data and that the two files are present. If this is the case, download them again from the Magimix website and start the process over again. My Cook Expert won’t turn on. Check that your Cook Expert is correctly plugged in. If there is no power, nothing will happen.